Want to know the exact time of sunrise in 2000? Or Carl Lehrburger's account of an equinox site with a noon hour sundagger formed by fallen rock? Then this site is for you. Uncommon information is provided such as "Old Celtic calendars observed Cross Quarters, approximately midway between each pair of adjacent Equinox and Solstice days. Unlike modern calendars that define the start of a season on a Solstice or Equinox, the Celts perceived Solstices and Equinoxes as events occurring mid-season, with the seasons actually beginning and ending on the Cross Quarters." 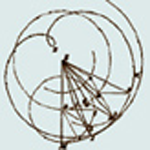 Interesting bibliography on ancient American petroglyphs and alignments. Ever wonder how atmospheric refraction affects the position of the sun? Especially at sunrise and sunset. This website by Victor Reijs presents a very technical view of atmospheric refraction with empirical as well as formulas for the position of the sun at rise and set. Extensive links to other sites on atmospheric refraction. 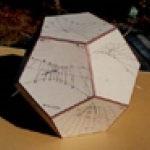 Here is Dr. Daniel Roth’s simple Azimut und Elevation der Sonne calculator based on equations from Pfeger’s Astronomy with the Personal Computer. Simple to use. There are other programs as well, including a calendar for any year, and the date of Easter. 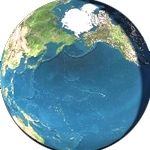 This program by Steven Pugh is an JAVA applet to show which parts of the globe are in daylight and which are in darkness. 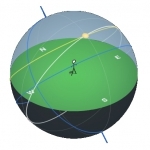 The position of the sun (projected on to the Earth) is shown as a yellow circle. Various locations around the world can be selected, and the date and time can be changed. For the currently selected location and the current date and time, information such as the number of daylight hours and sunrise/sunset times are shown in a panel on the right-hand side. 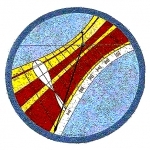 A plane or topographic map can be selected. JAVA run time plugin is required for your browser. Have you ever wondered what the division between day and night might really look like from space? The Earth and Moon visualizer does exactly that. Created by John Walker, co-founder of Autodesk, a variety of globe and topographic map views are available at the click of a mouse. Clouds? Today's weather? City lights? It's all there at your command. And click on "Details" explains how this all came about and the resources used to assemble these remarkable views. 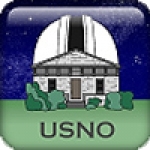 The National Oceanic and Atmospheric agency (NOAA) provides sunrise-sunset calculator and calculator for solar declination, azimuth, elevation, and equation of time. PDF files are available for low and high accuracy solar position equations as well as sun. There are both "old" and "new" calculators. The old provides tables of data, the new provides a more graphical interface on a world map. NOAA also provides links to other solar calculators. 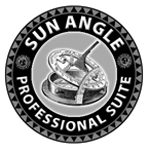 Want software that allows you to draw a variety of gnomonic sundials with a variety of details? Then Orologi Solari e Meridiane is the site for you. 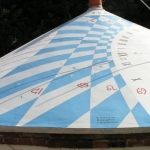 Gian Casalegno, an experienced Italian sundialist, offers both software and explanations of sundial construction. Illustrated here is the orologio del pastore, the shepard dial. (To allow easier construction, the gnomon is actually a slit in the top cardboard flange.) Want to draw dials with Babylonian (Hours from Sunrise) or Italian Hours (Hour to Sunset) or Temporal Hours (12 hours in the daylight)? It’s available at the click of a button with Gian’s software. What happens when you combined Google Maps with a Luni-Solar ephemeris? 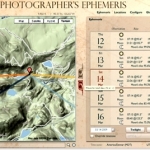 The answer is The Photographer’s Ephemeris, a wonderful (and free .. but donations accepted) program by photographer and programmer Stephen Trainot. The program is nicely laid out and easy to use. You can use the program to determine sun or moon rise and set against a real landscape of mountains and irregular terrain. And if you climb a mountain, you’ll find that your sunrise occurs just a bit earlier and your sunset just a bit later due to elevation depression. If Ansel Adams had this! 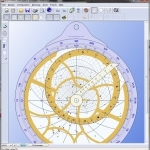 This is the website of Helmut Sonderegger, offering several sophisticated programs for constructing over 20 different dials with "Sonne", a general sundial construction program and "Alemma" devoted to making analemmatic sundials. 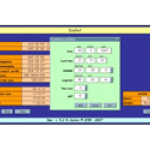 The programs offer many options for setting latitude, longitude,gnomon origin, line colors, dial furniture and auxiliary lines, and text options. Once the sundial is constructed, it can be saved in several different formats including DXF for etching or machining. Astronomy Education at the University of Nebraska at Lincoln provides a sun simulator showing the motions of the sun. Move the sun by the hour or through the year. Select display of the sun's declination circle, ecliptic, and analemma. The rotating sky lab has an instruction manual for the teacher and pre/post testing. Animations use Macromedia Flash (.swf) files. 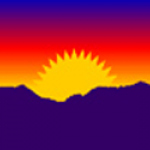 Sustainable by Design provides a suite of shareware tools on sustainable energy topics, including sun angle, sun position, and solar path. Good resource for both dialist and architect. Analyze louver shading and window overhang design. Sustainable by Design provides monthly climate, clouds, sun, temperature, and more for over 250 cities throughout the United States. Data is presented succinctly in graphs. Find out how much sunlight your city gets each month! On Carl Sabanski's Sundial Primer you can find basic definitions of sundialists and descriptions of how to make 39 different sundials. There are globe dials and horizontal dials, equatorial and vertical dials. And tools for calculating them. For example "SUN", an Excel spreadsheet application developed by dialist Ricardo Cernic. 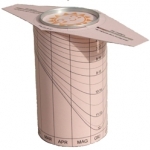 It provides a full solar ephemeris in English, Portuguese, French, Spanish. 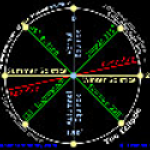 Provides Italian, Babylonian, and Temporal Hours as well as Local Solar Time and Sidereal Time. This is only one of many software apps freely provided by Carl Sabanski. This is a must visit site for anyone interested in dialing software. This USNO site offers simple formulas for computing the position of the sun, with an accuracy is about 1 arc minute within two centuries of the year 2000. Clearly written, it walks the user step by step to compute the sun's geocentric apparent ecliptic longitude and, given the mean obliquity of the ecliptic (tilt of the earth), the right ascension (longitude) and declination (latitude) of the sun. The formulas include the computation of the Equation of time. Fer J. de Vries created the most useful sundial construction software called de Zonnewijzerkring, or simply ZW2000. It is written for both 32 and 64 bit (Windows based) computers, and is intended to give accurate and exportable drawings (DXF and PLT format) of all the lines and curves you will need to make your sundial. 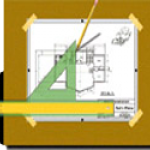 The exported drawings can be polished in other programs such as Delta CAD. Fer J. de Vries site is no longer available, but the software is made available through NASS as a zip file using the above link.